The State Department reacted Thursday to the latest round of rocket launches by terrorist group Hamas in Gaza and retaliatory airstrikes from Israel, reiterating America’s support for Israel’s right to self-defense. State Department spokesperson Heather Nauert was asked for reaction to the launch of a long-range missile by Hamas into Israel, which then led to Israeli airstrikes against what Israel said was a Hamas headquarters. 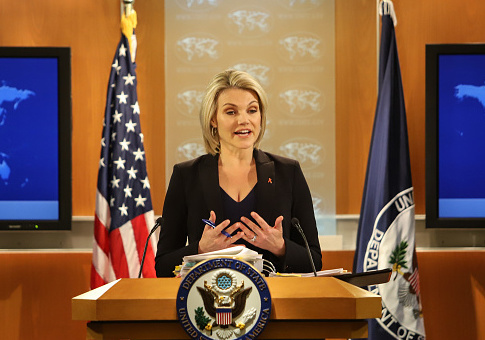 Nauert first said that the State Department was fully monitoring the situation in Israel before reaffirming the United States’ support of Israel’s self-defense. This summer has seen much unrest in Gaza, which has seen violence and rioting instigated by Hamas. Militants have launched kites with explosives on them being toward Israeli civilians and fields, in addition to attempting to break through border barriers. The post State Department Condemns Hamas Rocket Attacks, Supports ‘Israel’s Right to Defend Itself’ appeared first on Washington Free Beacon.